DC has a consistency problem when it comes to its Superman titles. Looking at the course of the Super-titles in the New 52, there were occasional flashes of greatness (Morrison and Pak/Kuder on Action Comics, Johns/Romita on Superman), but generally these books were such a mess that DC ended up killing off the New 52 iteration of Superman and replacing him with Superman from the pre-New 52 universe. The build-up to that event and the subsequent fallout failed to improve the quality of the Super-line, but that was all just setting the stage for Rebirth and the potential revitalization of the Superman brand. The relaunched Action Comics and Superman landed last month, and the latter has quickly emerged as the superior read. Fans of ’90s Superman comics will probably enjoy Dan Jurgens and Patrick Zircher’s Action Comics, but Superman’s fight against Lex Luthor and Doomsday in that title is far less compelling than the challenges of raising his son in Superman. Writer Peter J. Tomasi, artist Patrick Gleason, inker Mick Gray, and colorist John Kalisz are reuniting for the first time since their fantastic run on Batman & Robin, another title built on a father-son relationship, and they’re using this opportunity to show a different side of their craft. Superman’s world has a very different look and feel than Batman’s, and this creative team gives the book a warm, welcoming atmosphere that highlights the joy of the Kent family dynamic. Peter J. Tomasi and Patrick Gleason have been working together for nearly 10 years, and they’ve developed a creative rapport over that time that makes for an exceptionally smooth read when they work together. The difference between Tomasi’s work with Gleason in the last two issues of Superman compared to Tomasi’s work on the Super-titles over the last year is astronomical, and it’s not just because Tomasi is free from the endless stream of crossovers that swallowed those books. Gleason inspires Tomasi to aim higher in his scripts because he knows that Gleason will go above and beyond in bringing those ideas to the page, and their relationship is even tighter thanks to Gleason’s expanded role as co-writer on Superman. Gleason’s Robin: Son Of Batman was one of the most pleasant surprises of DC Rebirth, revealing that the all-star artist also has a talent for writing scripts that are fun, imaginative, and emotional. He did particularly excellent work bringing a childlike excitement to the story that accentuated the youth of the lead character, and that skill has been a boon for Superman, which largely focuses on Clark Kent and Lois Lane’s son, Jonathan. Like nearly all the DC Rebirth titles, the Superman Rebirth one-shot paled in comparison to Superman #1, and readers turned off by the continuity-sorting of the one-shot should seek out the first issue, which takes a very different approach to Superman’s narrative. That first issue is when Gleason, Gray, and Kalisz come on board and the focus shifts to Jonathan’s experience as a child discovering his erratic superpowers. Superman Rebirth artist Doug Mahnke is a superstar in his own right and one of the major influences on Gleason’s work, but Gleason has surpassed Mahnke when it comes to dramatic panel composition, rich character expression, and dynamic action. Simply put, Gleason is one of the best artists working in comics right now, and taking on the writer’s role has forced him to continue refining his visual storytelling to elevate the script. Superman #1 succeeded by casting Superman as an inspirational figure in the eyes of his young son, capturing the sense of awe and wonder that comes with having the world’s biggest hero as your dad. Those qualities are still present in this week’s Superman #2, which begins with Jonathan joining his father as he answers a distress call from a submarine with a broken propeller. That simple rescue mission turns into something more dire when a tentacled creature attacks from below, and Jonathan has to use his newly manifested heat vision to help his dad take out the monster. Gleason uses iconic Superman poses throughout the action sequence to reinforce Jonathan’s idealized view of his father, and starting the issue with superhero grandeur sets a point of contrast that heightens the intimacy of the later scenes. That gorgeous spectacle is an undeniable part of Superman’s appeal, but the family dynamics are what make it such an engaging read. The major conflict of these first two issues is that Jonathan’s body is changing and he doesn’t want to tell his parents about it, which is a fairly normal problem for kids except Jonathan’s change involves shooting beams of intense heat out of his eyes that accidentally incinerate their pet cat. Jonathan kept that a secret from his parents in the first issue, but his Super-dad can’t be fooled, especially when he can smell the change in ozone when his son uses his heat vision. Their adventure at the top of the issue is Clark’s way of getting his son to open up about what he’s going through, and it’s an important teaching moment for Jonathan as he learns what it means to wear an “S” on his chest. It’s not the most original sentiment, but it’s one that all children need to understand: Heroism doesn’t come from having power, it comes from doing the right thing and striving to be better, even when the world is trying its hardest to stop you. Gleason makes each emotional beat of this conversation clear in Clark and Jonathan’s facial expressions, with Clark shifting from pride to concern and back again while Jonathan feels admiration, regret, and relief as he comes clean about what happened Goldie the cat. The most powerful moment of the issue comes shortly after Clark and Jonathan head home, and the splash page of the Kent family holding a funeral for Goldie grounds the narrative by placing it in a relatable, personal context. They may be super, but they have problems just like any other family, and focusing on that domestic drama has made this series a refreshing change from the last few years of Superman books. Gray and Kalisz have become Gleason’s regular collaborators, and they match the specificity of his pencils in their inks and colors, adding texture and dimension that makes the artwork all the more immersive. The opening action sequence is a spotlight for Gray’s meticulously detailed inking, and the first shot of the tentacled menace emerging from the water is a stunning example of the thoroughness of Gray’s work. It’s also an impactful visual in terms of color; the purple and greenish yellow coloring of the beast pops against the cool blue of the environment, and the bright red of Superman’s cape draws the eye toward the hero. Superman has a phenomenal art team, but artwork of this caliber takes time and Superman is one of the DC Rebirth books on a biweekly schedule. That schedule takes a serious toll on artists, and while Gleason was originally solicited as the artist for the next issue of Superman, Jorge Jimenez has replaced him. On the plus side, Jimenez is a rising star that deserves a major gig, but having a fill-in after two issues doesn’t inspire much confidence for artistic consistency in DC Rebirth (this week’s Aquaman had a fill-in after just one issue of Brad Walker art). Consistency is already a big problem in the Superman line, so hopefully editorial is taking steps to ensure that there aren’t huge variations in the quality of the art between issues. It would also be nice if editorial allowed Tomasi and Gleason to continue telling their story with the intimate scope that has made these early issues so enjoyable instead of forcing them into events built more generic superhero ideas, which was an ongoing issue with the New 52 Super-titles. 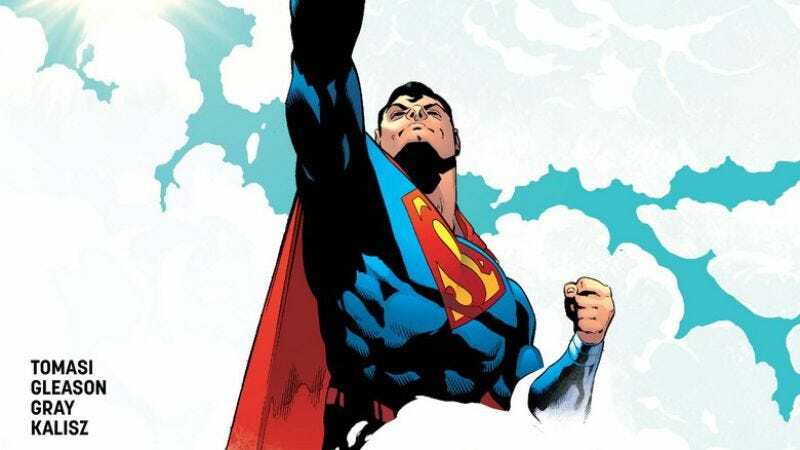 DC has a good thing going with this current Superman run, and it should encourage these creators to make the book even more personal and sincere, because that’s where their strengths lie.